Brainstorming retreat of GFMC staff, Mathislemuehle, Faculty for Forest andEnvironmental Sciences, Freiburg University (J.G. Goldammer, A. Held, D. Nagy,S. Verkhovets, S. Maisch); Mathislewald, Germany. Visit and briefing of the Joint Federal and Inter-State Operations Center forCrisis Management (GemeinsamesMelde- und Lagezentrum von Bund und Laendern – GMLZ). Discussions on jointmonitoring, early warning and reporting activities for wildland fires; GFMC. GFMC contribution to joint lecturing programme Basics in Ecology forSustainable Forestry in the Tropics and Subtropics, Faculty for Forest andEnvironmental Sciences, Freiburg University (J.G. Goldammer); Freiburg, Germany. On-site work with Working on Fire, Regional Subsahara Wildland Fire Network,South Africa (A. Held); Villiersdorp, Western Cape, South Africa. Presentation on Impact of Vegetation Fires on Ecosystems, Society andEconomies: Implications for International Policy Development and the Work of theUnited Nations, at KStV Brisgovia Student Fraternity (J.G.Goldammer); Freiburg, Germany. Meeting of the Executive Board of the German National Committee for DisasterReduction within the UN-ISDR (Deutsches Komitee für Katastrophenvorsorge -DKKV) (J.G. Goldammer); Bonn, Germany. Meetingwith the Emmendingen Landscape Conservation Association(Landschaftserhaltungsverband Emmendingen), Mr. H. Page, and HeidelbergUniversity, Ms. G. Zwach, on a thesis project on the use of prescribed fire inthe maintenance and restoration of sub-montane and montane grasslands in theBlack Forest; GFMC. Meetingwith Siemens AG Austria (J.G. Goldammer); Vienna, Austria. On-site field and institutional research, National Fire Management Plan forHungary (D. Nagy); Budapest-Sopron, Hungary. Consultations with the World Bank and the FederalRussian Forest Service, Aerial Forest Fire Protection Service (Avialesookhrana)(J.G. Goldammer); Moscow-Pushkino, Russian Federation. Reisepavillon 2004. Tourism and forest fires. A panel discussion. Virtual GFMCparticipation (J.G.Goldammer); Hannover, Germany. Work visit of FAO Forestry Policy and Information Division, Mr. Olman Serrano,on joint FAO-GFMC wildland fire activities in Latin America (C. Scholz, J.G.Goldammer); GFMC. Follow-up meeting of the SecondInternational Conference on Early Warning (EWC-II), including meetings with theISDR Secretariat concerning the follow-up arrangements of the UN-ISDR-IATFWorking Group on Wildland Fire; side meeting with the United Nations UniversityInstitute Environment and Human Security, on Wildland Fire Training Module; sidemeeting with UN Convention to Combat Desertification (UNCCD), on jointactivities within the UN Wildland Fire Advisory Group (J.G. Goldammer); Bonn,Germany. Training course on Civil-Military Cooperation in (CIMIC) in crisis management.German Armed Forces Support Command and CIMIC Bataillon 100 (J.G. Goldammer, A.Held, S. Teusan); Akademie für Krisenmanagement, Notfallplanung und Zivilschutz (German Academyfor Crisis Management, Emergency Planning and Civil Protection), BadNeuenahr-Ahrweiler, Germany. Annual GFMC training course Feuerökologie und Feuer-Management, FreiburgUniversity (all GFMC staff); Freiburg, Germany. Fire and grazing as instruments for maintaining nutrient-poor open landscapes inNorthwestern Germany <Feuer und Beweidung als Instrumente zur Erhaltung magererOffenlandschaften in Nordwestdeutschland> (J.G. Goldammer, A. Held); CampReinsehlen, Schneverdingen, Germany. GOFC/GOLD Land Cover Implementation Team Meeting (J.G. Goldammer); FriedrichSchiller University Jena, Germany. Foundation meeting of the Regional Northeast Asia Wildland Fire Network (J.G.Goldammer), Korean Forest Research Institute, Forest Fire Division; Seoul,Korea. Zwischen Hochwasser und Waldbrand  Klimawandel und die Konsequenzen fürdie Feuerwehr (Between Floods and Forest Fires  Climate Change andConsequences for the Fire Service). Umweltakademie Baden-Württemberg, inZusammenarbeit mit der Landesfeuerwehrschule Baden-Württemberg. GFMCcontribution Risiko und Bekämpfung von Waldbränden angesichts vonKlimawandel und zunehmender Sommertrockenheit: Neues aus der Waldbrandforschungund der globalen Entwicklung (J.G. Goldammer, A. Held, D. Nagy); Landesfeuerwehrschule Baden-Württemberg,Bruchsal, Germany. Advanced Incident Command Course presented by Working on Fire (WoF) incooperation with the Montana Department of Natural resources and Conservation,DNRC and the GFMC (A. Held).Theewaterskloof Dam, South Africa. Prescribed burning operations for conservation of heathlands in NW Germany (C.Scholz, D. Nagy, M. Hille); Lütjenholm, Bredstedt, Schleswig-Holstein, Germany. GOFC-GOLD international telephone conference (J.G. Goldammer); AT&T. On-site consultations and field visit with German Railways (Deutsche Bahn) onthe use of prescribed fire in railroad track vegetation management (J.G.Goldammer); Würzburg, Germany. ECOFIRE Progress Meeting 1, German Aerospace Center (J.G. Goldammer); Berlin,Germany. Global Geostationary Fire Monitoring Applications. A Joint GOFC/GOLD Fire andCEOS LVP Workshop; EUMETSAT (J.G. Goldammer); Darmstadt, Germany. 6th Annual Conference of the Global Disaster Information Network(GDIN), Panel on Advances in Information Management as it Relates to Fires (J.G.Goldammer); United States Department of State; Washington, D.C., U.S.A.
GFMC/ECE Conference on Forest Fire Management and International Cooperation inFire Emergencies in the Eastern Mediterranean, Balkans and adjoining Regions ofthe Near East and Central Asia (J.G. Goldammer, D. Nagy); Antalya, Turkey. Meeting of the European ISDR National Platforms on Disaster Reduction,facilitated by the ISDR Secretariat and the German Committee for DisasterReduction (C. Scholz); Bad Honnef, Germany. Workshop on Forests and Forest Ecosystems: Promoting synergy in theimplementation of the three Rio conventions (organized by UNCCD and CBDsecretariats, in cooperation with UNFCCC secretariat). Discussions will be heldwith the Global Wildland Fire Network and the three Rio Conventions, on jointprogrammes and common work in the Wildland Fire Advisory Group (J.G. Goldammer,C. Scholz); Viterbo, Italy. Meeting at FAO Rome for (a) signing a MoU between the FAO and the GFMC,concerning cooperation in the forest sector; (b) discussion of modalities of theGlobal Forest Fire Assessment in the frame of the FAO Forest ResourcesAssessment (FRA) 2005 and (c) cooperation in the Global Wildland Fire Network (J.G.Goldammer, C. Scholz); Rome, Italy. II International Symposium on Fire Economics, Planning and Policy: A GlobalVision. GFMC contribution Towards Developing a Global Wildland Fire Strategy.With a side meeting by some the ILC for the 4th InternationalWildland Fire Conference (2007) (J.G. Goldammer); Córdoba, Spain). Preparatory meeting of the ISDR World Conference on Disaster Reduction (WCDR) bythe German Foreign Office (J.G. Goldammer); Berlin, Germany. The GFMC informs that Mr. Tobias Zorn, member of the GFMC staff between April1999 and December 2000 and involved in the prescribed burning programme of theLandscape Protection Association, Emmendingen (Germany) since January 2004,passed away 22 April 2004. The GFMC expresses condolences to the family of thedeceased. Ninth Meetingof the Inter-Agency Task Force for Disaster Reduction, UN International Strategyfor Disaster Reduction (ISDR). GMFC to report on the progress of formation ofthe ISDR Wildland Fire Advisory Group and the Global Wildland Fire Network (J.G.Goldammer); Palais des Nations, Geneva, Switzerland. Meetingof the Regional Baltic Wildland Fire Network, hosted by the Ministry of Interior, Finland (J.G. Goldammer); Helsinki, Finland. Global Fire Experts Workshop (strategic planning meeting) of the IUCN-TNC- WWF Global Fire Partnership (C.Scholz, J.G. Goldammer); Sigriswil, Switzerland. Advanced Wildland Fire Management Course. A Joint UN Inter-Agency TrainingCourse for the SADC Region (J.G. Goldammer, A. Held); Nelspruit, South Africa. Foundation of the Regional South America Wildland Fire Network in theframe of the 3rd South American Symposium on Wildland Fire Control and the 7thJoint Technical Meeting FUPEF/SIF/IPEF on Wildland Fire Control at the Centro deCiências Florestais e da Madeira da Universidade Federal do Paraná (J.G.Goldammer, C. Scholz); Curitiba, Paraná, Brazil. Work visit of Prof. Nikola Nikolov, Faculty of Forestry, Skopje,Macedonia FYR, in preparation of the FAO FRA-Global Forest Fire Assessment 2005;GFMC. Colloquium Politicum ofFreiburg University, with GFMC contribution on Causes and Consequences ofWildland Fires and Forest Conversion Burning: Feedbacks Between SocialDisparities and Global Changes (J.G. Goldammer) (Lecture Hall 3042,University Building KG III, 20:00h); Freiburg, Germany. Preparatory meeting with German Railways (Deutsche Bahn – DB) and regionalauthorities of Unterfranken, Bavaria, in preparation of prescribed burningexperiments along DB railroad tracks (J.G.Goldammer); Würzburg, Germany. Preparations for mid-2004 prescribed burning operations for conservation ofheathlands in NW Germany (J.G. Goldammer); Lütjenholm, Bredstedt,Schleswig-Holstein, Germany. Field research and support mission for the World Bank and government ofKazakhstan in the fire management component of the Kazakhstan ForestRehabilitation and Protection Project (J.G. Goldammer, S. Teusan, E. Davidenko,N. Yezhov); Almaty, Astana, Semey, Kazakhstan. Support of the fire policy workshop LokakaryaKebijakan Kebakaran Hutan dan Lahan di Indonesia kini dan identifikasi tantangandan kecenderungan kedepan (28-29 July 2004) and policy backstopping for theEU-supported South Sumatera Forest Fire Management Project (J.G.Goldammer); Palembang, Sumatera Selatan, Indonesia). Field expedition (fire history and fire impact) in Tibet (J.G. Goldammer);Beijing, Lhasa, China. Work visit of Prof. Hartmut Gossow, University of Vienna, in preparation of cooperativetri-lateral agreements on fire management cooperation between Austria, Sloveniaand Italy; GFMC. Prescribed burning operations for conservation of heathlands in NW Germany (A.Held, M. Hille); Lütjenholm, Schleswig-Holstein, Germany. Training Course Integrated Fire Management for Fire Managers inMozambique, Wildland Fire Training Center Africa in conjunction withEnvironet Solutions (A. Held); Kruger National Park, South Africa. Visit of Dr. Mark Adams and Dr. Tina Bell,Bushfire Cooperative Research Center (CRC), Melbourne, Australia, concerningcooperation between the CRC and the GFMC; GFMC. Workshop Sector-Crossing Information Management for Transboundary DisasterPrevention and Preparedness and introduction and presentation session “DisasterHazard and Vulnerability Atlas for Southern African Countries”, organisedby INWENT (A. Held), Pretoria, South Africa. Work visit of Ms. Anne Branthomme, FAO, and Mr. Myong Soo Won, Korean Forest Research Institute (KFRI); Forest Fire Division and Coordination Unit of the ISDR Regional Northeast Asia Wildland Fire Network, on global firemonitoring; GFMC. Foundation meeting of the Regional Caribbean Wildland Fire Network (C. Scholz,J.G. Goldammer); Universidád de Pinar del Rio, Facultad de Forestal y Agronomía, Cuba. Attention: Meeting has been postponed ! Workshop on Large-Area Forest Fires, organized by the Polish ForestResearch Institute and the PROFOREST Centre of Excellence. GFMC contributions onmonitoring of large fires and on the fire problems in Hungary (D. Nagy); RudyRaciborskie, Poland. Arrival of visiting scientist Ms. Annalisa Bogo, Universitá degli Studi diPadova, Italy, for a joint research programme on wildfire disaster managementtraining (7 September – 23 December 2004); GFMC. GFMC participation in the International Nomination Committee of the MoscowInternational Junior Forest Prize, and celebration of the All-Russian ForestDays and 10th Anniversary of Avialesookhrana-owned aviationfleet (J.G. Goldammer); Moscow and Pushkino, Russian Federation. Workshop on Land Reclamation in Peace Time: Conversion 10 years After TroopWithdrawl (Konversions-Sommer 2004). GFMC contribution on the use of prescribedfire in maintaining heathland habitats on former military areas (A. Held, withE. Brunn, Federal Forest Office Lausitz,); Rathenow, Brandenburg State, Germany. Conference Wildfire  A National Strategy ?, organized by the GrampianFire and Rescue Service, in partnership with Her Majestys Fire ServiceInspectorate for Scotland (J.G. Goldammer); Aberdeen,Scotland. 10thMeeting of theInter-Agency Task Force for Disaster Reduction, UN International Strategy forDisaster Reduction (ISDR). GMFC to report on the progress of formation of theISDR Wildland Fire Advisory Group and the Global Wildland Fire Network (J.G.Goldammer); Palais des Nations, Geneva,Switzerland. Mr. J.G. Goldammer receives the Award for Distinguished Service to the JointFAO/ECE/ILO Committee on Forest Technology Management and Training, at theoccasion of its 50th Anniversary; Palaisdes Nations, Geneva, Switzerland. Meeting with Fire Watch International AG, Luzern, Switzerland (Ms. M. Neuss);GFMC. Eastern European, Near East and Central Asian States Exercise on Wildland FireInformation and Resources Exchange – EASTEX FIRE 2004 with participation of the FireServices of Bulgaria(host country), Albania,Bosnia & Herzegovina, Greece, Macedonia, Serbia & Montenegro, and Turkey,supported by the Global Fire Monitoring Center (J.G. Goldammer, D. Nagy);Haskovo Region, Republic ofBulgaria. United Nations International Workshop on the Use of Space Technology forDisaster Management. 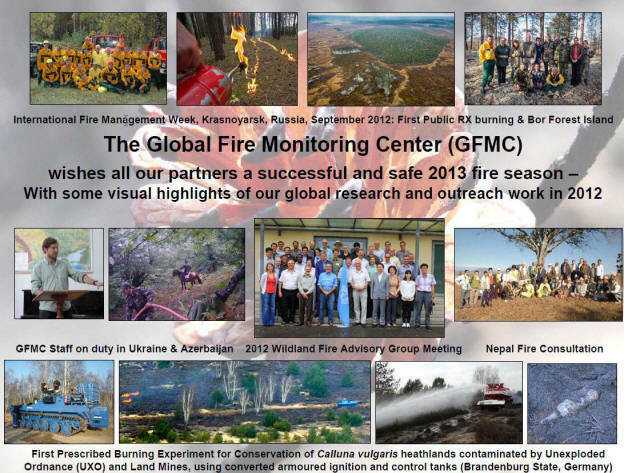 GFMC contribution The Global Fire Monitoring Center inSupport of the United Nations to Respond to Wildland Fire Disasters (J.G.Goldammer, A. Held); Munich, Germany. Meetings of the Regional Wildland Fire Networks of South America, CentralAmerica, Caribbean and North America (C. Scholz, J.G. Goldammer); San José,Costa Rica. Pan-American Wildland FireConference (C. Scholz, J.G. Goldammer); San José, Costa Rica. Wrap-up meeting of the Pan-American Wildland Fire Conference (C. Scholz, J.G.Goldammer); San José, Costa Rica. FAO/ GFMC / UNU Training Course for Instructors in Community Based Forest FireManagement (CBFiM) (A. Held, D. Nagy); Nelspruit,South Africa. ECOFIRE Interim Meeting on Scientific Assessment of Space borne High TemperatureEvent (HTE) Observing Mission Concepts, Task 2: Assessment of HTEs parameters(J.G. Goldammer); German Aerospace Center (DLR), Oberpfaffenhofen, Germany. ASEAN HazeTechnical Task Force (HTTF), ASEAN Ministerial Meeting on Haze and First Meetingof COP to the Haze Agreement (J.G. Goldammer); Hanoi, Viet Nam. Ex GFMC staff member, Mr. Georg Buchholz, Currently ASEAN Secretariat, Jakarta,Indonesia, and Ms. Unna Chokkalingam, Center for International Forestry Research(CIFOR), Bogor, Indonesia, married; Christchurch, New Zealand. Congratulationsby GFMC staff! Regional GOFC/GOLD Workshop “Satellite-basedfire monitoring network in Northern Eurasia: Methods, Data Products,Applications” (N.N. ); Moscow, Russian Federation, 17 November 2004. Internationalconference Impacts of the Drought and Heat in 2003 on Forests. GFMCcontribution Heat, Drought and Wildland Fires in Eurasia in 2003, on 18November (J.G. Goldammer, A. Held); Freiburg University, Freiburg, Germany. On-site inspection of test sites for the use of prescribed in controllingviticulture pests; Federal Agency for Biological Control in Agriculture andForestry, Institute for Plant Protection in Viticulture (BiologischeBundesanstalt für Land- und Forstwirtschaft, Institut für Pflanzenschutz imWeinbau) and GFMC (J.G. Goldammer); Reil-Bernkastel, Germany. Meeting of the Executive Board of the German National Committee for DisasterReduction within the UN-ISDR (Deutsches Komitee für Katastrophenvorsorge – DKKV)(J.G. Goldammer); Bonn, Germany. Regional Forest Congress Forest Policy: Problems and Solutions. GFMC contribution Recent Trends of Forest Fires in Central Asia and Opportunities for Regional Cooperation in Forest Fire Management; GFMC presentation on Recent Trends of Forest Fires in Central Asia and Opportunities for Regional Cooperation in Forest Fire Management (J.G. Goldammer and E.P. Davidenko, Regional Central Asia Wildland Fire Network); Bishkek, KyrgyzRepublic. Meeting of the UN-ISDR Wildland Fire Advisory Group / Global Wildland FireNetwork; GFMC, Freiburg, Germany. Presentation of GFMC on Burning Fossil and RecentCarbon Stores; Interdisciplinary Lecture Cycle of the Faculty for Forest andEnvironmental Sciences and Faculty for Chemistry, Pharmacy and Geosciences(Fakultät für Forst- und Umweltwissenschaften and Fakultät für Chemie,Pharmazie und Geowissenschaften, Ringvorlesung im Wintersemester 2004/2005: DerKohlenstoff im System Erde. Brennendefossile und rezente Kohlenstoffspeicher) (J.G. Goldammer); Freiburg University,Freiburg, Germany. Retreat of GFMC staff; Mathislemuehle, Mathislewald, Hinterzarten, Germany. GFMC expanding its office facilities (Building 076, attached to Old Airport Tower). Former GFMC and IFFM staff member Hartmut Abberger resuming work at GFMC.